Don`t give much strong pressure on the mesh pouch when packaging to avoid being out of shape and please clean the stove in time after burning for lasting lifetime. 【ECO-FRIENDLY FULE】This stove Just use leaves, twigs and wood of dead trees from nature as a fuel.No need the expensive liquid canister ,causing the environmental pollution and burning your money. 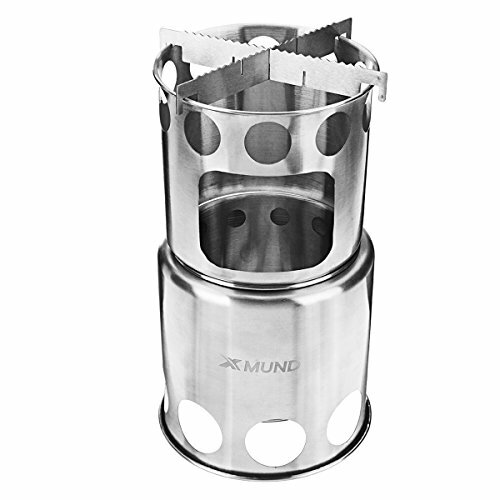 【STURDY STAINLESS STEEL】Crafted with high quality stainless steel,the camping stove will steadily burn bright ,works well under heavy weight or high heat,and anti-rust for outdoor use. 【EASY TO INSTALL】Place the air inlet base in a flat and put the Ash Box into Pot Stand，then put the whole part that is combined in second step into the air inlet base, finally place the cross bracket . 【COMPACT AND LIGHTWEIGHT】Easily collapsible and lightweight,weight only 0.57lb/9.17oz,has minimal impact on the weight of your backpack,free up more space in your backpack. 【USING OCCASION】Outdoor wood burning stove & camping backpack and Hiking stove for anyone looking for a high quality, great value product for the camping world or bug out bag to enjoy at the cookout with the people you love. If you have any questions about this product by Xmund, contact us by completing and submitting the form below. If you are looking for a specif part number, please include it with your message.